Amongst the Acanthizidae (scrubwrens) Pilotbirds are distinctive enough to warrant their own genus - their closest relatives are the bristlebirds. 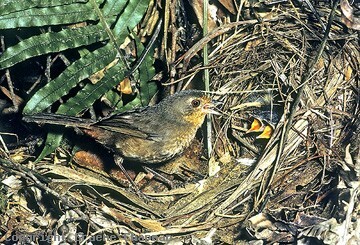 The Pilotbird gets its name from its commensal feeding behaviour, essentially following in the footsteps of the Superb Lyrebird. Pilotbirds occur only in far S.E Australia, ranging from the Sydney region south to the outskirts of Melbourne in the Dandenongs. They maintain permanent territories in rainforest and other wet forest habitats from the tops of the ranges right down to the coast. In some places near the coast they also occur along the moist margins of creeks extending out into heathland. Their life-history is fairly well known. They are very poor fliers and most of their time is spent on the ground foraging through the undergrowth. In places where they share their territory with Superb Lyrebirds this includes spending time following the diggings of the lyrebird as it turns over the soil. 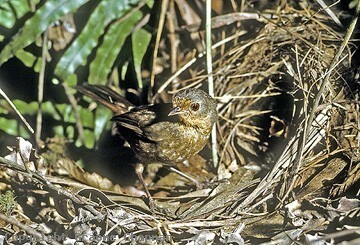 The female Pilotbird alone builds the nest and incubates the three or four eggs but the male does help to feed the nestlings. The nest is a small grassy football-shaped structure sometimes lined with feathers placed on the ground. In this respect the birds must have some idea of just where to place it. Even though there was water running all around it, the nest in these pictures actually survived a major rain/flood event when most other birds nests in the area failed. Pilotbirds are certainly more often heard than they are seen. Their main loud territorial song, likened by many to the phrase "Guinea-a-week" can be heard ringing down the gorges from quite a long distance away. The song varies a bit from place to place as you would expect from such a sedentary species. (Listen on sound page).